This is the second hands-on post of our journey to SpaceRock Miners. We are going to start modeling the game: we should have an initial class model for the Output block by the end of the post. I must say that I decided to license this under the MIT license. It basically allows you to use it for whatever you want, however you want, given that you follow one simple requirement; it doesn't even require attribution. Read it here. From this point on, I am assuming you read the previous post and successfully achieved allegro compilation. Also, you must have a basic grasp on C++ as well as understand the basics of Object Orientation. I'd like to emphasize that this tutorial has an intermediate level of difficulty, so it may be overwhelming for some of us. If so, go around the web studying Object Orientation, Modeling and programming. A media_manager class that issue the basic commands, like draw, play sound and update, to the System block; it is part of the Logic block. A media_system class that will implement an interface between the media_manager and Allegro itself, in order to decouple our game from Allegro as much as possible; coupling is never good if you can avoid it. 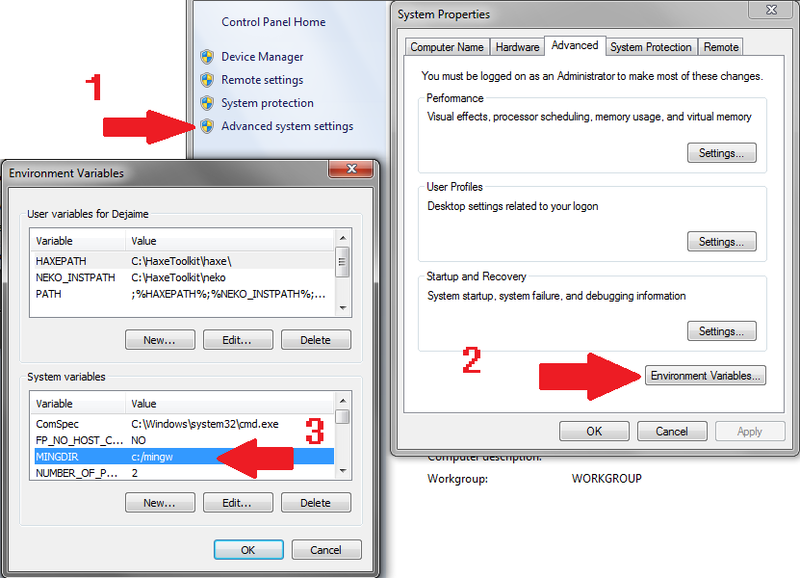 A allegro_media to manage all the actual drawing, rendering, resizing [...]. Highly coupled with Allegro. Will implement the System portion of all our graphical needs. Looks easy, doesn't it? Still, these classes will have a lot of stuff in them. Stop and think for a second: what do we need it to do for us? Update the display for every frame. This small list shows us that we need some more classes: one for Sprites and one for the User Interface. The User Interface needs one more thing: Text; what takes us to the next class we need, one for Text and Fonts in general. I'll be leaving the sounds out for now, and add it later. The Sprites needs Bitmaps, that are the images themselves which, as do the fonts, need to be loaded from disk, so we need some way to do it. All of these classes need their own interface for system access, so I guess 8 more classes on the way: 4 interfaces and 4 system block classes. But my guess is probably wrong and it'll take more classes. An interface is really simple to implement, it is basically a list of functions; while the system classes are where we actually implement these functions. In a sense, an interface is not a complete class, but since we are using C++ it is a class and is declared as one. This is getting bigger and bigger, ain't it? I think that if we go straight to our IDE and start to mash our keyboards it'll get even worse. What should we do? We should plan. Plan our Manager classes in advance, so we can think of what they'll need (system interface functions that the manager will use) and how they'll interact with the other classes (their own interface, that the manager will provide). How do we do that?, you ask me. This is called modeling, and is something really simple to explain but hard enough to make big companies hire specialized professionals to do it for their big programmer nightmares games. Everyone learns as they do. A classic case where the necessity to know something teaches it to you. The more you do this, the better you do this. We will use an Open Source UML tool called ArgoUML. I am not going to talk about UML since I am not very experienced with it myself. In addition, my posts are already 3x bigger than I wish they were (megamoths!). Still, there are plenty of resources on UML over the web, feel free to look it up! playableMusic - an specialized playable that represents background music, allowing for different volume and other special features. These are (for now) the classes I'll use for the Output block of our first project. This System-Output-Logic architecture is really good for small projects like this one, but not ideal for medium or big ones. When we finish this, we can experiment with another architecture. In order for these to work, we'll need the system block to actually do everything they need it to, like allocating memory, loading sound/image files, render stuff. The Logic block will actually use these classes to output to the player the current game state. I may need to change, add or remove one or two, as I model the whole game and any problems along the way. The programming necessary to all these classes alone can be quite big. For this reason, I won't be able to go over every line of the code or function explaining it. Still, I'll try to keep all the code decently commented and formatted, while explaining the functions and classes; it should be enough. The point of this guide is not for you to read and compile the result project on your machine; it is for you to create a project with the same (or higher) complexity and write it yourself! If you want to use the same architecture we are using here, go ahead, but I would recommend you to try and create one for your project or, at least, make sure you understand why we need the classes we are using. There's no way to program anything 100% decoupled from the operational system we are working. Even with java and other interpreted technologies we will face some differences between platforms; C++ is no different. Even though the language itself is cross-platform, the environment isn't. As cross-compiling is something I, personally, find hard to use and sometimes frustrating, I simply set up my environment for all the necessary platforms. "Why are you blabbing about that? ", you ask me; well, we are about to enter the part where it gets harder to keep the code 100% cross-platform. For this project, I aim to make a game that is completely platform independent at source level. Even though it may even end up cross-platform, this block will be highly tied to Allegro 5. If we ever need to port this for, say, SDL, we'd need to rewrite a lot of code in here. sysPlayable - our system level sounds. These will be significantly harder to code than the ones up there. The classes here are more complex due to the fact that they actually do the work. The ones up there are mere interfaces for our game, through which it tells the platform what, where and how to render a sprite or what sound and how to play it. The first classes we will build will be the sprite and sysSprite, but how? Class Attributes, what goes where? I assume all of you have made a simple "animated sprite" prototype where you can draw a cute animated sprite somehow; maybe even translated horizontally, speed it up or down, this kind of stuff. So I ask, what attributes does a sprite needs? To start off with the right foot, I'll list the ones I'll be using. bool translate_horizontally; - Rotates the sprite horizontally if true, not really useful for our game. The high level sprite class is supposed to be created 1-1 for every entity using them. For an example every asteroid on our little game will have its own instance of the sprite class, with its own "current frame", its own rotation, et cetera. This way, we avoid the problem where every asteroid would be moving in a synchronous manner with every other one like a lame choreography. This is why we need all of them to have its own state. Scaled, Rotated, doesn't matter, similar sprite objects share only one sysSprite instance. The system level sysSprite class is supposed to have only one instance for every different sprite. 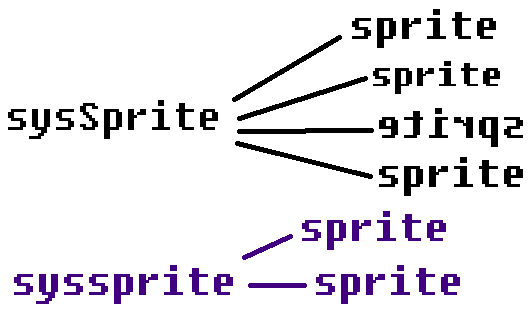 Every similar sprite would need an instance of a sprite class object but all of these sprite objects would be linked to a single sysSprite object. This saves us from wasting memory and cpu by loading the same sprite image several times. We should use a similar approach to the sound system. Now that you (hopefully) understood the relation between the sysSprite and sprite classes, it gets easier to understand that sysSprite std::multimap. It is nothing more than a matrix, a matrix that stores a string on the first column (animation names like IDLE, FLYING, [...]) a number on the second (the duration of a given frame) and an allegro5 bitmap (the image itself) on the third. This way, whenever we want to play the idle animation for our spaceship, we'll be able to simply go through the frames of the spaceship's sprite where the animation is called IDLE. Of course, string isn't necessarily our best approach, but I opted for it over simple numbers so they get a little clearer for us to understand. But still, do you see the problem arising here? We'll need to have a structured way to store animated sprites; we'll probably need a similar solution for the sounds in the game. I don't know about you, but I smell XML. Next step: create the sprite and sysSprite classes and test them. What'll we need? Aside from a lot of patience, we'll need an Allegro 5 project properly linked and tinyxml. If you don't have tinyxml, no problem, get it here. A little playing around tinyxml would do good for us as I don't plan to spend too much time on it, explaining it and how to use; but, if you prefer, you can ignore it and program a custom file parser using fopen: your call. I recommend tiny-xml. and the not-that-easy road to out first playable prototype. Today we are going to talk about what makes a game and our next steps towards our first prototype. This is the first post of the real game making; that btw consists of planning and developing. First things first, we are going to start with the planning. I'll try to make a concise series of posts, try to go through it all while making the games and prototypes. For those who know a little C++ and knows a little Object Orientation or, at least, Data Structures. A game is... well, everyone knows what a game is; hard to explain. Still, what are the components of an average computer or console game? Since this is a game programming blog, I'll talk about the way I see a game: as a software. Any game, on high level, can be modeled as three integrated main blocks: System, Logic and Output. Simplistic high-level model of a game. The System block is responsible for anything related to the OS and Hardware, where most platform-specific code comes in. Ideally, when porting your game to other platforms, this will be the only block that would change. The Logic block is the game's logic itself, the inner workings, rules, simulation. It depends on the System block to handle tasks like creating timers and managing memory; and also depends on the Output block to gather input and update the game multimedia layer. The Output block prepares the Interface and Sounds to be played by the System block, as well as gets input from the player. As you can see, both the Logic and Output blocks depend on the System, but the system does not depend on them. In a sense, it can be said that both the Logic and Output blocks are part of the System block; but I like to separate things as much as possible. To know which block will end up more complex is really game-specific, as simple tiled RPG's would require a good Logic block, but small System and Output blocks. A war FPS, on the other hand, would need tougher System and Output blocks, in order to give the game the realism and precision it requires, the Logic would basically respawn players, do physics simulation and ragdolls. It is useful to model your game in order to create a good software architecture. A bad architecture would kill your development, requiring lots of time consuming fixes and changes, so in the end you can have an acceptable result. The model you'll choose, is entirely up to you, but try not to overcomplicate; specially when we just started, too much effort to do things the right way can halt our progress. We'll start by choosing a simple prototype project, one that can be done. "What's a prototype? ", you ask me. Well, by prototype I mean a really basic game, that is far from complete, but illustrates its concept. Prototypes can have a single level and no sound, awful graphics and still be used as a concept showcase. Our first prototype will be a space game inspired on the classic Asteroids. First thing we should do is actually design our prototype (duh). We'll not be creating a Game Design Document (GDD) or a Technical Design Document (TDG) or we would be killing flies with bazookas. In our game, we will control a spaceship flying through multiple asteroids and try to destroy as many as possible. We can destroy them with our gun or, differing from the classic, colliding with them. That's the basic idea of the game. Asteroid Integrity bar, asteroids will have different resistances. Simple enough, this is our prototype. Let's now think on our model now, for a second. This game has little need for user interface, it's just a ship, its projectiles, asteroids and a hull integrity bar. The input is 5-buttons, 4 directionals and shoot. Piece of cake here. The game logic needs some basic physics simulation, respawning of asteroids is pretty easy tho. Still, if we add a focus bar, we'll need a better physics simulation. Light weight rendering, timed sounds, some timers, nothing too hard. A data world, to manage everything other than physics. A game manager, to wrap them all together and interface them to system specific code. As you can see, it is not easy, but doable (I hope!). So, as you probably realized by now, our System is our Game Manager, our Logic is our Game World and our Output is, both, the Media and the Input Managers. Note: the media manager will be really dependent on the System block, so we'll need to create an interface class inside the System block to interface it with the OS and Hardware while keeping them decoupled. Since this is a programming guide, I simply jumped over all the design process. 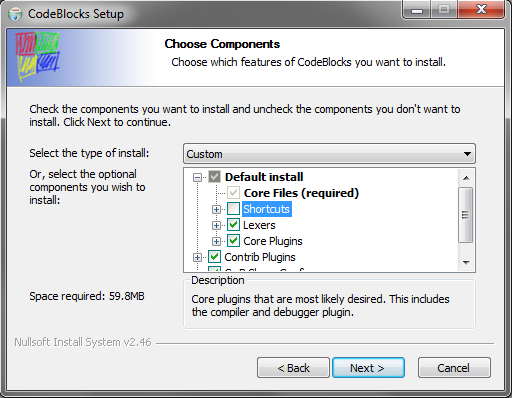 Still, I can't jump over the process of creating the project with Code::Blocks. Following, we should build and properly link our libraries and start the programming. 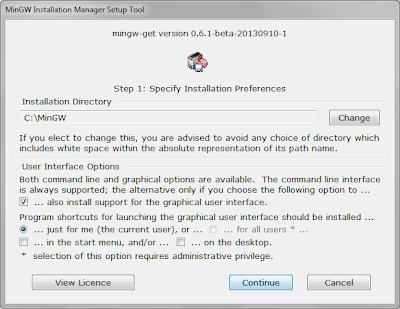 Probably create the media manager and, following, the input manager. The game world comes next, I guess it'll be the hardest part of the guide. Lastly the game manager. Once the game manager is up, the game prototype should be all up and ready. I will be using Allegro for this prototype, but it really saddens me that they still have a mandatory requirement of DirectX SDK. This SDK isn't installing properly on lots of machines since they try to rollback your runtime files, the system forbids it, halting the installation (S1023). 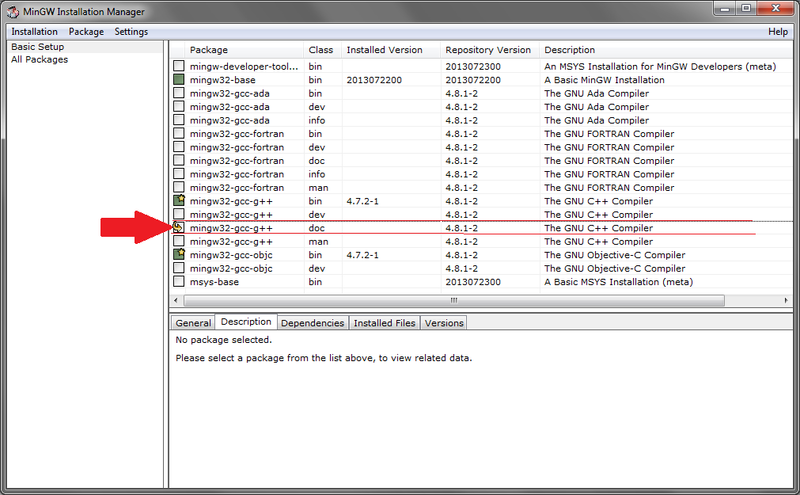 It requires the complete removal of all Visual C++ runtimes, which we will need to reinstall right after. Tedious process. 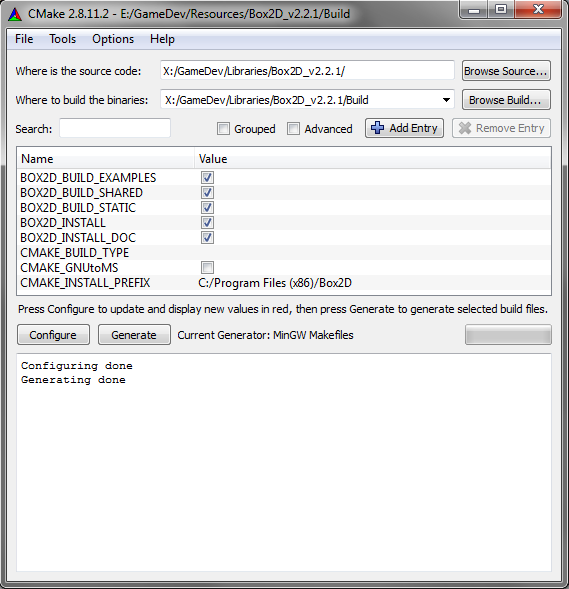 I recommend downloading the binaries if you do not want to go through all the trouble to install the DirectX SDK. 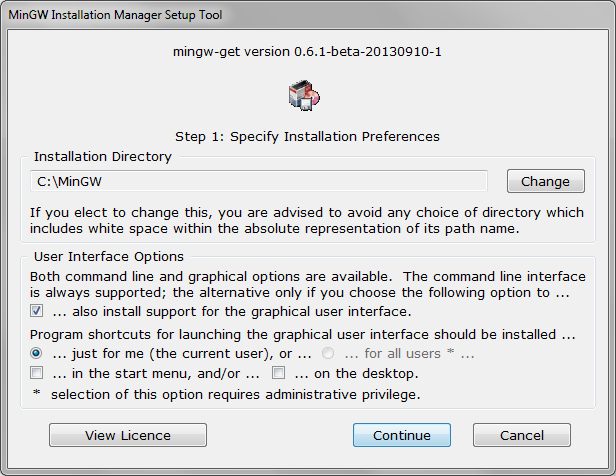 We'll be using Allegro 5.0.10, If you'll be using the binaries, get the them for MinGW 4.7.0 . I will rebuild Allegro here since I need to confirm it is as I remember. 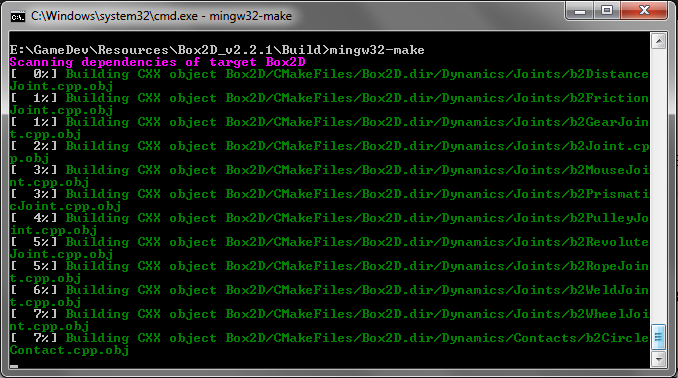 Maybe, we can integrate Box2D to manage the game's physics. Still, given the simplicity of the game, it would be too much. Box2D would be used just as an initial tutorial. Answering the question, we will need Code::Blocks and MinGW, along with the Allegro 5.0.10 binaries for our version of MinGW, 4.7, and maybe Box2D built and working, but this one is not certain yet. This blog was created by Dejaime Neto, to teach the very basics on game development to anyone who wants to learn. If you are wondering what the name of the blog means, it's just as stupid as you thought. Build and Run (aka F9) + Run and Gun = Build and Gun. Gimme a break willya? I'm a programmer, not a marketeer! I am one of those crazy dudes that believes it is not worth paying for something that is just slightly better than an Open-Source or Freeware alternative, if better. That said, I will always use free resources, IDEs, libraries, tools. This is specially good for beginners and hobbyist, since, as me, they probably won't want to spend USD$ 500 microsoft asks for visual studio, to name one. On top of that, I see no point on teaching game development using a demo version of such, as many many books and online resources do, since if you ever get to something you think is releasable you'll have to pay for the license in the end. I am a mechatronic engineering student and hobbyist game developer. My engineering background allowed me to learn C, C++ and very little Assembly. Picked up a bit of Java along the way, but didn't like the trade-offs; maybe I'm a control freak or smth. As of scripting languages, my favorites are Ruby and, specially for games, Lua, Brazilian like me. My favorite game development books are Game Coding Complete 4thEd by McShaffry and Graham and Programming Game AI by Example by Mat Buckland, both beginner books, if you have already been introduced to C++. Why bother building up a web blog if you won't be adding any monetizing like ads, referral links [...] ? I believe that one doesn't know something until they are able to explain it. That's what I'm doing here. I'm putting my own knowledge to test, trying to bring up articles, tutorials and posts on the subject of game development, allowing me to diagnose my own strengths and weaknesses. In the future, I want to build sample open-source games and prototypes, really simple ones, since I learn a lot by sample code; specially complete and finished games and prototypes code. This would put my own skills to check once again, see if I can actually praxis what I know. You don't know if you can do something until you try. I'm trying, at the risk of worldwide embarrassment. And I hope you'll do the same. I can also train my english at the same time! win-win-win-win situation! Primarily Code::Blocks, for C++ programming. Haxe, the most cross-platform engine I've found. C++, for everything, since it is cross-platform and the most powerful language I've used. 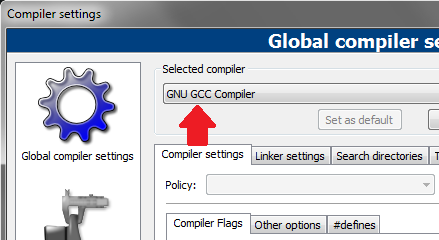 I'll be using some C++11 features, so remember to set the -c++11 compiler flag. Lua, if we ever get to a point where we can use script on a game prototype. Ok. Now you know what I'll use. All that's left is to know how I'll use all of this stuff. Higher Level Game Engine (HLGE): This would be the blog's child, that'd mean the blog had actually paid off and all our hard work was not for nothing! The HLGE would be a higher level engine that incorporated Box2D physics, rendering (probably with one of the 3 libraries listed above or maybe OpenGL directly), that maybe I make a post in the future explaining it further. As you can see, I am setting my expectations really, really, high. So, please, If I fail to accomplish any or all of these, please don't throw stones at me, throw burgers! At least that would make me less sad over my own failure. If, after reading this, you feel all motivated and stuff (what I doubt, btw), and you want to help me accomplish this dream by making it part of your own dreams too, contact me. I must warn you that I am, as of now, a terrible programmer, and this will certainly slow me, us, down. You can reach me at dejaime <at> buildandgun.com . This blog is proudly hosted by Blogger, Google, free of charge.